I was still looking for a good solution up until last month when someone from PS Love Co contacted me over email and was asking if I'm interested in reviewing their heat patch range. 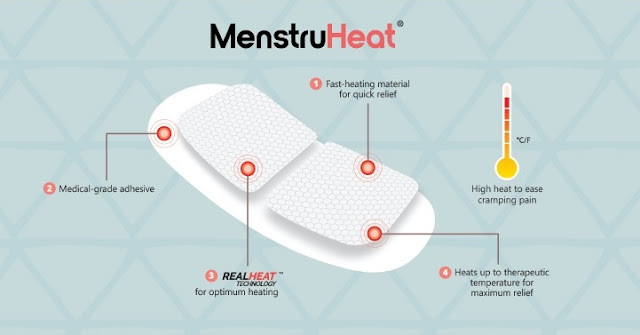 To be honest, I don't have much experience with this kind of product, except that one time I tried a menstrual heat pack from another brand; so I was really curious in finding out how much different the heat patched from PS Love Co would be. 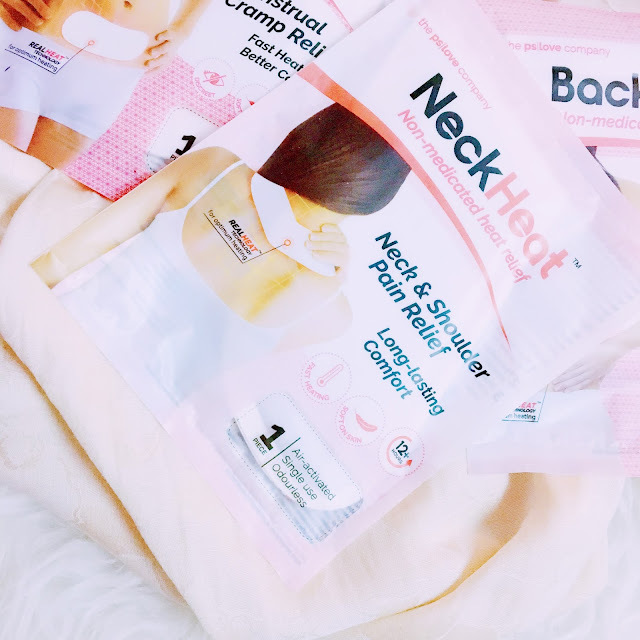 First of all, I was informed that they have 3 types of heat patches available for purchase which is the Menstru Heat Patch, Back Heat Patch and Neck Heat Patch. 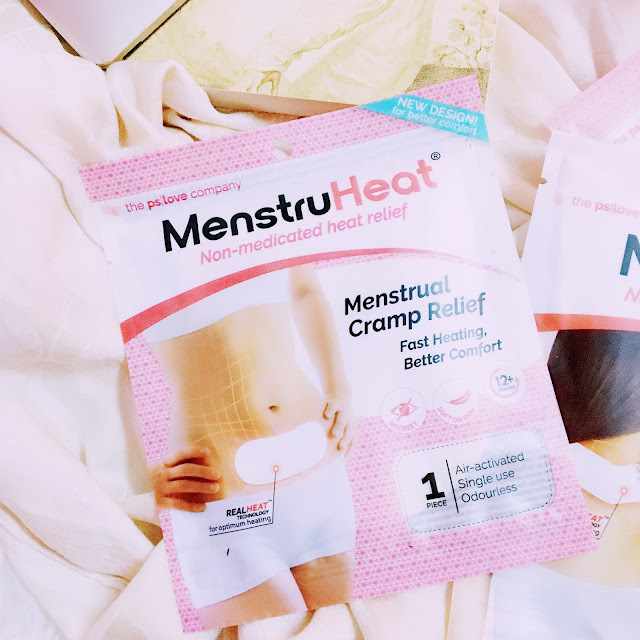 Each patch contains ingredients such as iron powder, carbon and salt and is triggered to produce heat when in contact with air, which is based on the exothermic reaction. Their unique formulation also helps to adjust the temperature (increase/decrease) so the patches are able to create enough heat to relieve discomfort effectively. The heat level for each type of the patches may vary ranging from 40-60 degrees. Period cramps can be annoying. It's uncomfortable and always make me unable to concentrate on things that I am doing. Previously, my best bet at soothing down the pain is by taking medication. I don't like to put on medicated oil especially in the office as it tends to smell. Knowing that applying heat on the cramp area is actually a clinically proven way to treat it, this MenstruHeat patch is now my new favourite when it comes to kicking the cramps away. 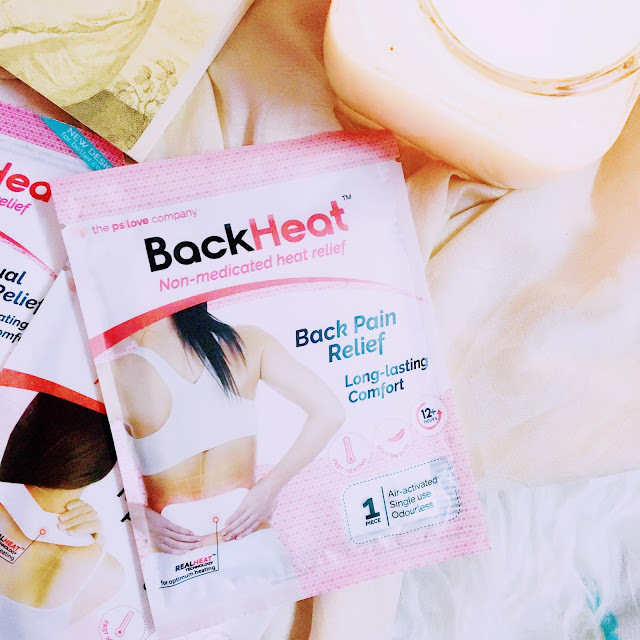 This product is designed to fit nicely on your tummy and it only takes 5-10 minutes to heat up. 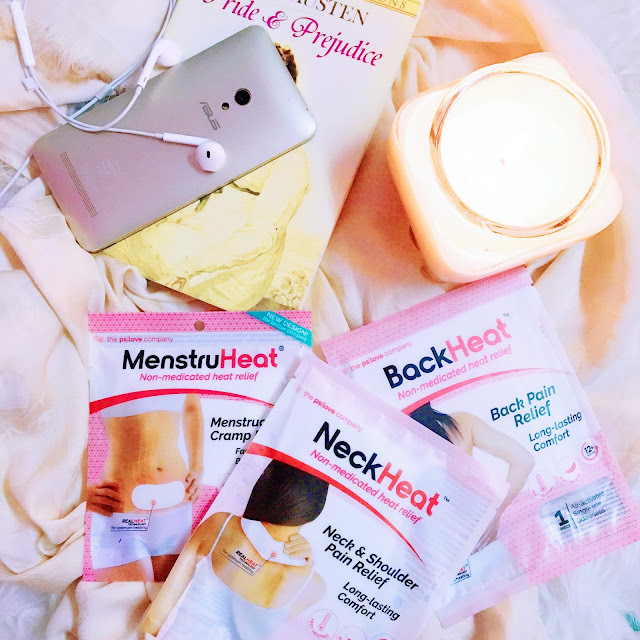 MenstruHeat contains the most heat compared to the Back and Neck type but it's not the type of heat that will burn you. They do recommend to try sticking it on top of your cloth first to test it out before actually sticking it directly to your skin just in case your skin is too sensitive. It's also advisable to give your skin a five minutes rest for every two hours to avoid any unwanted reaction on your skin (eg: rash). Back pain is my number one enemy lately. Since I'm doing an office job, it's unavoidable for me to keep on getting stuck to the chair for at least 7-8 hours daily. Occasional stretching does help to wake up the sleeping muscle on my back (especially waist area) but there are days when even that can't do much. It was a really uncomfortable issue that's been stressing me out lately. Some people suggested me to use a medicated patch to relief it but as I mentioned above, I don't really like the strong scent of those patches. The odourless characteristic of the PS Love Co patches is actually one of the strongest reason why I like these patches so much. I am actually planning to get more of this type because it feels like heaven whenever I apply it, especially after a long day at work. Totally my favourite out of the three. 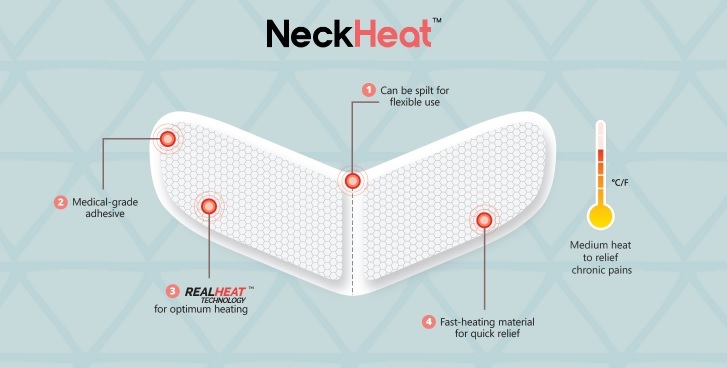 The last type among the three varieties of these heat patches is designed for the neck. This patch is especially unique because you can choose to just stick it on your neck area straight away, or split it into two parts for a more flexible use on targeted areas. Just like the back patch, the PS Love Co Neck Heat Patch also works wonders to give relief on stiff shoulders/neck. And oh, did I mentioned this before? 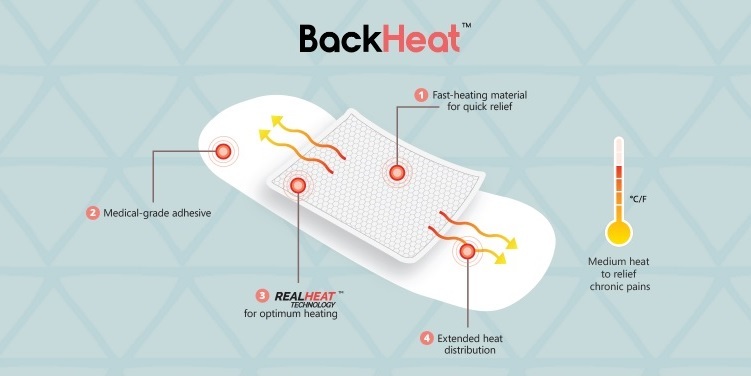 These heat patches actually last up to 12+ hours. That's pretty long right! I can use it for half a day before the warm effect totally goes away. I don't recommend it if you want to use it overnight (during sleeping time) though. You have to remember to give your skin a rest every two hours to avoid over heating the skin. In overall, I actually have no complaint about these products from the PS Love Co! They actually work and each of them is very affordable. Retailing for RM7.64 each, you can purchase them on pslove.co/shop if you want to give them a try yourself! They are currently offering FREE shipping from Singapore to Malaysia, so you better get it fast. One more good news for you, do use the code 'ANISOFF' at checkout to get an extra 20% discount on your purchase! Meaning you'll save about RM1+ for each patch. This discount code will be valid until 31st May 2017.